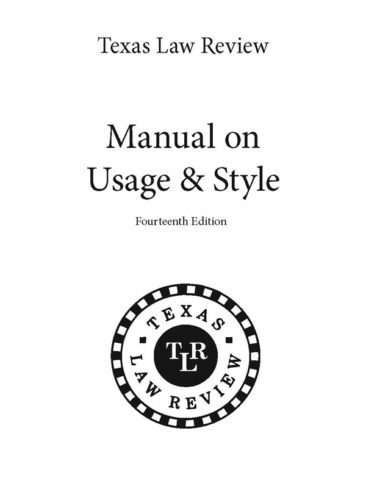 The Texas Law Review Manual on Usage & Style is a pocket- sized guide to style and usage for legal writing. A convenient and accessible reference tool used by many lawyers and law students. Called MoUS for short, it contains rules on topics including punctuation, capitalization, numbers and symbols, italicization, grammar, word choice, quotations, composition, and editing. Our MoUS 14th Edition remains a valuable tool for law journals, practicing attorneys, and other legal writers. Price includes USPS shipping with higher shipping priorities available during Checkout.